As technology transforms and enhances so many different spheres of life, it is only natural that these technologies have a huge impact on the healthcare sector as well. In fact, 2019 healthcare trends increasingly point to technological advances in the healthcare sector. It goes much beyond the digitization of health records, which provide comprehensive medical records and detailed patient data and private information. Technology has made it possible to quickly identify disease and infection, create targeted medical solutions and offer minimally invasive surgical options. It has facilitated communication and has significantly eased workflow. Paper filing of a patient’s health records, test results etc. are almost a thing of the past in some advanced countries. Even digital records are now stored on the cloud rather than offline storage such as the hard drive of a medical facility. This gives easy access to health records to medical professionals as well as patients. The agonizing wait time of patients and their loved ones for test results or definitive diagnoses reduces significantly. The other benefit is that medical professionals on the other side of the world from a patient can quickly assess a situation to offer second opinions and better, advanced treatment options. Telemedicine or ‘telehealth’ are commonly used terms that refer to video consultations between medical experts or interactions between doctors and their patients. Medical professionals can view scans, assess diagnostic reports, monitor symptoms and physical progression of a medical condition remotely. This means that the patient can consult without having to personally visit their consulting doctor; something that could be difficult, expensive or in cases unadvisable from a medical standpoint. Developments in telemedicine have several directly positive impacts: less travel for the doctors and their patients, less crowded clinics and waiting rooms, and more streamlined medical front desk operations. This has meant significantly improved access to medical facilities for patients in remote or rural areas. AI is all around us today. In the medical field, it helps speed up and improve diagnostic processes, creates innovative solutions, and can even help with early treatment approaches. For instance, an AI-based diagnostic device that identifies conditions such as diabetic retinopathy by scanning the retina is already a reality and has been found to be highly accurate. Radiotherapists and oncologists are already using AI to speed up processes, increase accuracy and reduce costs. Chatbots are using AI-based message and voice systems to deal with patient queries and save money. Not only that, these bots can help with filling prescriptions, making appointments and billing processes. Right now, AI also plays an active role in pharmaceutical R&D: algorithms can test biological or chemical interactions safely and accurately. This helps speed up the process of drugs reaching the markets; effectively saving lives. In times to come, more specialists will be applying AI to diagnostic and treatment processes. The idea of advanced robots performing complicated surgery is no longer in the realm of sci-fi. Robots in healthcare is an idea whose time has come! Robotic equipment performing high precision, minimally invasive procedures is a reality today. Additionally, robots are helping to deliver medical supplements, medications, and diets specifically tailored for individual patients. In the absence of a human presence, robots can monitor the vital signs of a patient, and call for human intervention when necessary. They can assist in surgeries. They can help disinfect patient rooms and reduce human exposure to possible contagion. Robots can even perform tedious tasks such as taking blood samples without having to prick the skin repeatedly to find a vein. The robot can accurately identify the blood vessel and make the extraction quickly, causing less pain. Experts predict that the use of robots in the medical field is set to shoot up in 2019. Applied to healthcare, IoT (internet of things) becomes IoMT; bringing together healthcare tech, telemedicine, apps, and wearables. Right now, medical experts are tracking and helping prevent chronic illnesses with the use of wearable EKG/ ECG, blood pressure, temperature, and glucose level monitors. 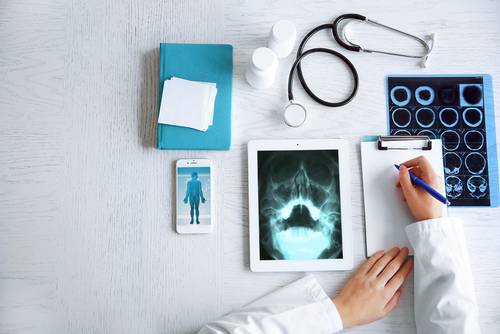 An estimated 60% of healthcare operations have adopted IoMT or IoT devices; helping increasing profitability and improving the level of care. Experts estimate that by the year 2020, there will be 20 to 30 billion IoMT devices in use! Virtual Reality, Augmented Reality and Mixed Reality are no longer confined to entertainment and gaming. These XR applications are changing the way doctors treat patients. They help improve experiences, reduce risk, cut costs and offer new therapies where none existed before. For instance, these applications can help kids with ADHD or elders with Alzheimer’s. Elders with dementia, cognitive impairment or even with physical mobility issues can virtually enjoy experiences that they may not be able to in their physical environments. XR applications can help improve emotional wellbeing, and may even improve cognitive functioning. In times to come more doctors will be using XR applications to customize medical procedures and make accurate diagnoses. Consider how technology has changed medical consultations. Remote consultations, counseling, instant transmission of data such as scans, ECGs and other reports make it possible for patients to consult with or get a second opinion from super specialists practically anywhere in the world. Research and development in the healthcare space have made drugs more effective and economical for patients. Advanced R& D has spearheaded targeted treatments never before envisaged. For instance, we now have access to gene therapy in cancer treatment, keyhole surgeries have become commonplace, and hi-tech equipment has made diagnostic processes more accurate and reliable than ever before! Blockchain is a technology that uses secure shared digital data using a peer to peer system and can integrate easily and effectively into the healthcare sector. Data and healthcare information becomes more portable and accessible while remaining secure and complying with industry standards. Right now, data science offers healthcare professionals valuable information and analyses to help formulate treatments. Information about patient-drug interactions, patient-environment outcomes can help tailor procedures and length of hospital stays to deliver lasting treatments. Health care professionals can identify and address regional trends or epidemics, ethnic predispositions and genetic vulnerabilities to predict and control the disease. While medical practitioners are yet to implement a common technical standard for these technologies, experts predict the mainstreaming and standardization of these technologies in times to come. Many of the technologies mentioned above are currently in use to varying degrees in different parts of the world. Their adoption and mainstreaming in the healthcare space is only set to increase. More and more of these applications will be seamlessly integrated into preventive medicine to improve overall well-being in times to come. These technologies will create new surgical and pharmaceutical treatments and genetic engineering will create solutions and cures for conditions thought to be untreatable. Experts predict exciting times for the healthcare industry where healthcare providers will have the satisfaction of creating effective, lasting and customized solutions for patients in their care. Naval Kishor is an astute healthcare professional enabling healthcare enterprises to adopt digital business models and globally recognized expertise in the domains of health and technology. He shares his insights, opinions and ideas through diverse digital platforms like websites, social media and forums. His writings focus on cutting-edge technologies and trends and topics like health, lifestyle, travel and many more.